Day 2 of the 2011 Coutts Quarter Ton Cup delivered decidedly less sun, but plenty more wind. With a solid 12 knot northeasterly blowing from early morning, the competitors were released from the marina at 09.00 and racing started bang on time at 10.30. After a couple of general recalls caused by the fleet's collective over-enthusiasm, race three eventually got away at the third time of asking. From the very first beat Louise Morton's Espada, helmed by Colette Blair, Rob Gray on Aguila and Cote, owned by Darren Marston and Olly Ophaus, were all engaged in a nip and tuck battle at the front of the fleet. There was nothing between all three of these boats for the entire race with each of them taking the lead at various points. In the end Aguila crossed the line overlapped with Espada to take the line honours victory, with Cote just two boatlengths back in third place on the water. On handicap however Espada squeaked to victory by just a single second ahead of Aguila in second place. Cote had to concede third place to Ian Southworth's Whiskers by five seconds on corrected time, pushing her down to fourth, ahead of Paul Treliving's Odd Job. The breeze had reduced by a couple of knots by the time the fleet lined up for the start of race four. However the startline enthusiasm of the fleet remained undiminished, forcing another general recall before it could eventually get away. Rickard Melander on Alice II won the committee boat end of the line and took an early lead going up the first beat. By the top mark though it was Espada and Cote which were fighting it out for the lead once again. These two boats continued to play a cat and mouse game with each other for the rest of the race, with Espada eventually gaining control to take the win on the water by 10 seconds. This was good enough to give the Espada crew their second corrected time race win of the day, ahead of Cote in second and Whiskers in third. Fourth was Alice II, with Panic, owned by Paul & Mark Lees, taking fifth. With conditions moderating a little more and just the hint of rain in the air, race five got away under a Black Flag. With two wins under their belts, the Espada crew were now on a roll and saw off sustained challenges from Kote, Alice II, Eamonn Rohan's Anchor Challenge, as well as George Kenefick's Tiger to take another first both on the water and on corrected. Tiger corrected out into second, followed by Cote, Alice II and Anchor Challenge. The various attempts to start the final race of the day involved a variety of penalty flags and resulted in five boats receiving Z-Flag penalties and a further five disqualified under the Black Flag rule. The Irish crew on Anchor Challenge finally found their true form to take a line honours and corrected time win, ahead of Whiskers in second and the ever-present Espada in third. John Welch on Phoenix took fourth with Jamie McDowell & Brett Linton's New Zealand entry Blackfun awarded fifth place after incurring a Z-Flag penalty. With all of the scheduled six races completed and the regatta now back on track, the results show a new overall leader in the shape of Louise Morton's Espada. Her impressive 1,1,1,3 scoreline for the day sees them hold a 16 point lead going into the final three races tomorrow over Ian Southworth's second placed Whiskers. Yesterday's overnight leader, Rob Gray on Aguila, has dropped down to third tonight, just 1 point behind Whiskers and 6 ahead of George Kenefick's Tiger in fourth. Rounding out the top 5 at the end of Day 2 is Eamonn Rohan's Anchor Challenge. In the newly introduced and hotly contested all ISAF-certified amateur Corinthian Division, George Kenefick's Tiger tops the leaderboard from Laurent Beaurin's 45 South in second and Lancelot, owned by Matt Clark & Tony Thackray. On the eve of the final day of racing the fleet assembled at the Royal Corinthian Yacht Club for the regatta gala dinner and enjoyed a fantastic after dinner speech from British singlehanded yachtswoman Sam Davies about her exploits in the Vendee Globe around the world race. 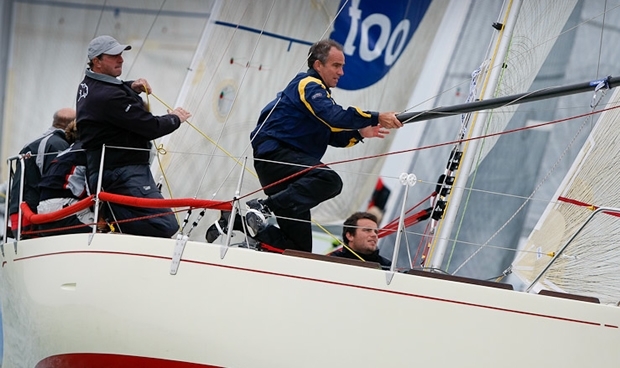 Racing at the 2011 Coutts Quarter Ton Cup concludes Wednesday 13 July with three more races scheduled.